Georgia (Georgian: საქართველო, Sakartvelo) is a Eurasian country located in the Caucasus region which borders the Black Sea to the west, the Russian Federation to the north, and Turkey, Armenia, and Azerbaijan in the south. Once a constituent republic within the Union of Soviet Socialist Republics (USSR), Georgia has been an independent country since the dissolution of the union in December 1991, despite having declared independence in April of the same year. Under the Soviet system it was called the Georgian Soviet Socialist Republic (GSSR). Its capital, and largest, city is Tbilisi (თბილისი, Ṭ'bilisi). Ethnic Georgians call themselves Kartvelebi (ქართველები), their land Sakartvelo (საქართველო), and their language Kartuli (ქართული). These names are derived from the name of Kartlos, said to be the ancestor of the Georgian, or Kartveli, people. According to the medieval Georgian chronicles, Kartlis Cxovreba, Kartlos was a son of Togarmah, the grandson of Japheth. The historian Josephus, however, believed that it was Tubal who had given rise to the Caucasian Iberes. 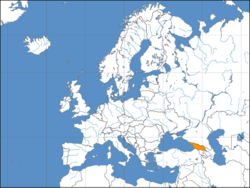 The exonym "Georgia" is probably derived from the Persian designation of the region of Georgia – گرج, Gurj, meaning "gorge" – which reached the Western European crusaders and pilgrims in the Holy Land who rendered the name as Georgia and explained its origin by the popularity of St. George among the Georgians. Another possible etymology is that Georgia was so named by the Greeks on account of its agricultural resources, since geōrgía (γεωργία) means "farming" in Greek. The proto-Georgian tribes first appear in written history in the 12th century BC. The first two Georgian states to emerge were the Kingdom of Colchis in the western coastal plain of Georgia and the Kingdom of Iberia, known to its inhabitants as Kartli, in the mountainous east. After the campaigns of Pompey in 65 BC, Colchis became the Roman province of Lazicum, while Iberia became a client state of the Roman Empire. In the 2nd century AD, King Pharsman II of Iberia achieved full independence for his kingdom from Rome. During the 3rd century AD, the Lazi tribe came to dominate most of Colchis, establishing the Kingdom of Lazica, locally known as Egrisi. Christianity was established as the official state religion of Iberia in 337 AD under King Mirian III, making Georgia the second oldest Christian country after Armenia. In 523 AD, Christianity was declared the official religion in Egrisi as well. Much of Georgia's territory was besieged by its Persian and Turkish neighbors along with Arabs and Mongols over the course of the 7th to the 18th centuries. After 11 centuries of mixed fortunes of various Georgian kingdoms, including a golden age from the 11th to 13th centuries, Georgia was forcibly absorbed into the Russian Empire in the 19th century, its people suppressed by Czarist regime and its royalty exiled. In the aftermath of the Russian Revolution, Georgia was briefly an independent republic from 1918 to 1921. In February of 1921, the Communists came to power following an invasion of Georgia by the Red Army, and in 1922, Georgia became part of the Transcaucasian Socialist Federative Soviet Republic (TSFSR). In 1936, it became the Georgian Soviet Socialist Republic (GSSR). Georgia formally declared its independence from the Soviet Union on April 9, 1991, although it wasn't widely recognised until the dissolution of the Soviet Union on December 25, 1991. The majority of the population (83.9%) practices Orthodox Christianity and are members of the Georgian Orthodox Church. Religious minorities include Armenian Orthodox (3.9%), Muslims (9.9%), Roman Catholics (0.8%), as well as a small Jewish community in Tbilisi (0.1%) and various Protestant minorities. Of those recorded in the 2002 census, 0.7% declared themselves to be adherents of other religions and 0.7% self-described as non-religious, agnostic or atheist. Christianity was first preached in Georgia by the apostles Andrew, Simon the Zealot, and Matthias in the 1st century AD. The final conversion of Georgia to Christianity in 326 AD is credited to St. Nino of Cappadocia who is considered to be the "Enlightener of Georgia" and "Equal the to Apostles" and is one of the most venerated saints of the Georgian Orthodox Church. Her tomb is located at the Bodbe Monastery in Kakheti, Georgia. The official language of Georgia is Georgian (ქართული), one of the four South Caucasian languages native to the region. Abkhaz (Aҧсшәа) is the offical language within the autonomous region of Abkhazia. Georgian is spoken by 71% of the population, 9% speak Russian, 7% Armenian, 6% Azeri, and 7% other languages. Other South Caucasian languages, in addition to Georgian, spoken in the country are Mingrelian, Svan, and Laz. The South Caucasian, or Kartvelian, languages are a unique language family, distinct from Indo-European, Semitic, and Turkic. Georgia's current population is 4,636,400 with ethnic Georgians (including Mingrelians, Svans, and Laz people) forming a majority of about 83.8% of the population. Azeris form 6.5%, Armenians 5.7%, and Russians 1.5%. Numerous smaller groups in the country, including Abkhazians, Ossetians, Assyrians, Greeks, Kurds, Jews, Tatars, Turks and Ukrainians, form 2.5%. The Abkhazians in Abkhazia and the Ossetes in South Ossetia have tried to secede from Georgia since its independence. The Georgians are a South Caucasian, or Kartvelian, people. The four major subdivisions within the broader Georgian ethnicity are the Kartveli (ქართველი), who comprise the majority of the population of Georgia; the Mingrelians (მეგრელი), who live predominantly in northwestern Georgia; the Svans (სვანი) of the Svaneti region of Georgia; and the Laz (ლაზი) who live primarily on the Black Sea coastal regions of Georgia and Turkey. ↑ On February 25, 1921, the Republic of Georgia became part of the Union of Soviet Socialist Republics, which later would be dissolved. ↑ Curtis, Glenn E. (2004). Georgia a Country Study. Kessinger Publishing. p. 89. ISBN 1419121650. ↑ Burney, Charles, & Lang, David M. (2001). The Peoples of the Hills: Ancient Ararat and Caucasus. New Edition. Phoenix Press. ISBN 0297004956. This page was last modified on 12 August 2010, at 23:09.